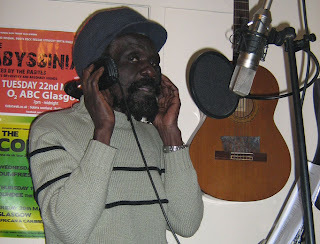 Last week Leroy Jones aka Jah Dave came up from London to put down some vocals. He ended up staying for a week, put down lead vocals for over 20 songs and has joined the band. Leroy was a founder member of The Congos with Ashanti Roy in 1973 and has worked with many other acts like Gregory Isaacs, Horace Andy, Johnny Clarke, Sugar Minott, Dub Syndicate to name a few. He still tours with The Congos as a percussionist and keeps Gregory Isaacs' music alive by singing his tunes, most recently supporting Beres Hammond and Tarrus Riley at Wembley Arena. So now we are 3 and watch this space for some new previews coming as soon as I can get some mixing done. We still plan to release the first single early next year. Tell your friends.